The legend of Jeju’s grandmother, Seolmundae Halmang, is central to the mythology of the island, and many tales abound of her momentous size and strength. She was reportedly large enough to use Mount Halla (which she created from mounds of mud) as her pillow, while she laid her body on Mount Gogeun and rested her legs on Beom Isle. Unfortunately, as she was making a cauldron of soup for her 500 sons, she toppled in and drowned. Upon returning home, her sons proceeded to eat the soup, not realizing that their mother was in the pot until the youngest son discovered her bones in the bottom. Realizing what had happened, the sons were petrified with grief into stone. These stones, known as the 500 Generals, are the rocks at Yeongsil on Mount Halla, while the youngest brother stands on Chagwi-do. 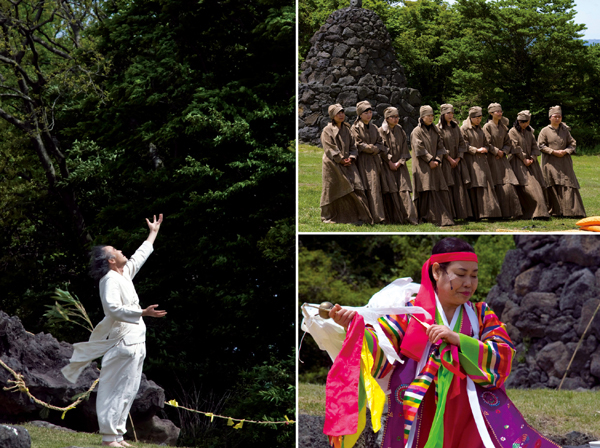 A festival in the grandmother's honor was celebrated for the second year on May 15 at Jeju Stone Park. The festival had a somewhat serious tone compared to other local festivals, and many attendees dressed for the occasion in suits. Most of the festival-goers seemed to be either an older generation or parents with young children. Song Joung Hee and Kang Soo Kyoung, two graduate students from Jeju University studying Korean History, said that they were interested in the festival because it was a good opportunity to see Jeju celebrate its ancient mythology. They also attended last year, and said that while the festival was bigger last year, there seemed to be a steady turnout this year as well. The festival began in an open field surrounded by eight enormous stone cairns. Local residents clad in white and yellow costumes began a slow march into the center of the field, solemnly drumming and dancing to clear a spiritual path for the goddess to enter. Mime performer Jo Seong Jin, dressed in a flowing white robe, continued to invite the goddess in a performance that evoked the beauty and tragedy of the legend as he danced among the stones. He finally accepted an offering of paper from the other dancers that was sym-bolically transformed into silk clothing for the goddess, urging the crowd to remember that Seolmundae Halmang believed that every stone was her child, so we should take good care of them all. Once the paper had been turned into clothing for the goddess, the festival was off to an auspicious start. Next, women in traditional brown dress, along with a monk, began a series of prayers for a good harvest and for many children, inviting the crowd to come closer and participate fully. More offerings to Seolmundae Halmang were brought forth and placed on an altar, including fruit, candles and makgeolli. The prayers continued as everyone was served a lunch of noodle soup and pork. After lunch, a Jeju grandmother dressed in a beautiful multi-colored hanbok began a long and somber recitation of the legend of Seolmundae Halmang, chanting and drumming as she told the tale. The beautiful, serious tone set by the grandmother’s tale was followed by two performers wearing masks and costumes that emerged from the woods to perform a tragicomedy that evoked a tale of pain, redemption and spiritual cleansing. The smaller of the two began the dance, and was soon joined by a fertility figure possessing three large breasts, which she used to dispense grain to the crowd. As the smaller dancer became increasingly wrought with pain and suffering, screaming and roiling on the ground, the larger goddess figure quenched her spiritual fire with water from her bosom, allowing her to rise from the ground and peacefully drift off along a path of white cloth. The ceremony closed as the two masked performers circulated and drew people into a dance, joining their hands together as the drumming and chanting began. You really can’t say no to a huge triple-breasted goddess leading you to dance, so the festival ended in a spirit of joy, laughter with strangers, and exuberance. ⓒ Jeju Weekly (http://www.jejuweekly.com) All rights reserved.